I am a big fun of combos and always like to use products within the same brand. Here I tried these Three Little Wonders from Ole Henriksen, where you get a morning boosting serum, a moisturizer and a night invigorating serum to promote healthy skin with daily exfoliation, hydration, and protection. A three-step daily regimen developed for an effective, easy, and healthy skincare routine to treat all major skin concerns. They all come in 1 oz containers which are pretty good size to consider; it will carry you from 4 to 5 months. This Three Little Wonder retails at $86.00, which carries a value of $131.00 if you were supposed to buy it one by one. It is a great value compares to other skin care products in the market. 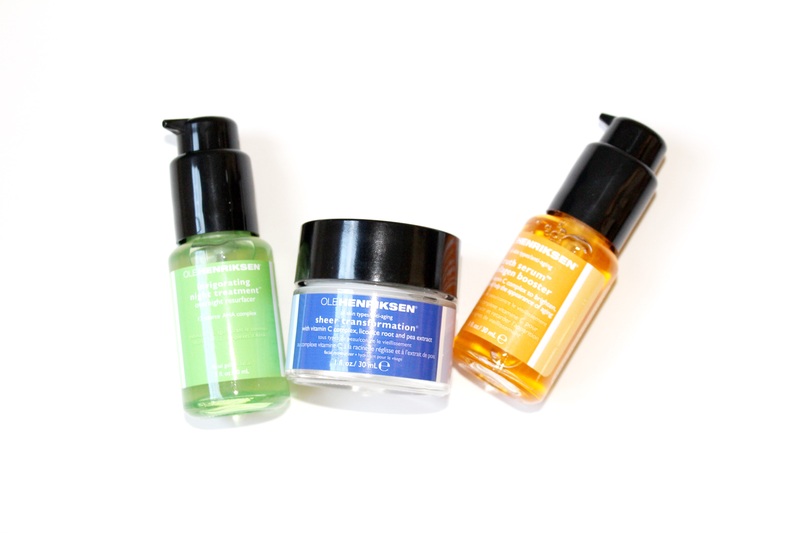 Ole Henriksen is known for carrying a great range of skin products with natural ingredients. All these products are free of Parabens, Sulfates and Phthalates. 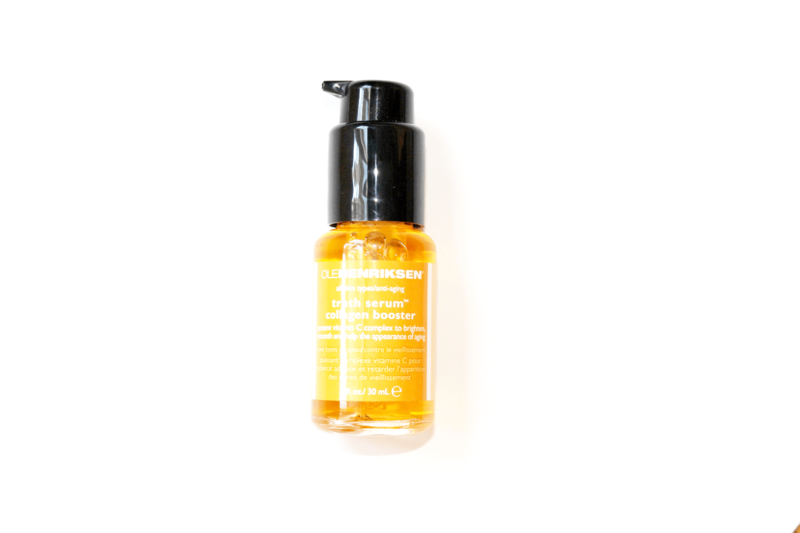 This serum from Ole Henriksen is a booster, infused with a high powered vitamin C complex to help out fine lines and wrinkles while preventing future damage. It is filled with antioxidants and moisture bending ingredient to hydrate and keep your skin nourished and protected. It’s absorbed instantly and penetrates to the deeper layers of the skin where it goes to work to prevent from long term results, and it is paraben free. It is meant to use first in the morning after cleansing to refresh the skin. Get one pump to your finger tips and apply all over clean skin in the morning. The smell is so refreshing, I totally love it. Sheer Transformation Moisturizer from Ole Henriksen is a light weight moisturizer. It has a silky texture that melts into the skin. Skin feels fresh, healthy and bright. A potent blend of Actiwhite Liquorice and vitamin C helps fade dark spots, even skin tone and prevent premature sighs of aging. It claims to purify the skin to minimize pores while glycerine lightly hydrates. It does contains vitamin E which will heals, restores and nourishes the skin, leaving skin healthy looking, and with smooth refreshed complex, and it is for all skin types. Can be used as a day or night moisturizer. I totally love how it’s very light and gets into the skin easily. Last but not least, the night treatment serum from Ole Henriksen is powerful gel that seals in essential vitamins and minerals for deeply nourished skin. It supports natural cell turnover, improves the appearance of fine lines and wrinkles, and smooth texture, which leaves in a beautiful, radiant, youthful looking complexion. I am always a big fan of night serums; it actually treats the skin while the skin is relaxing during night. It is sulphate and paraben free. I totally love the night serum where I can really feel it’s working into my skin after deeply cleansing the skin. And when I get up in the morning I can really see the glowing skin.